When I was young, radio shows such as American Top 40, or Billboard were the established authorities on determining the most popular artist or album. The internet has revolutionised the distribution of music and it’s no surprise that there is no shortage of innovation in the delivery of informational services. Recognising that popularity includes discussions, consumption as well as purchase, the BBC has created an index of bands and tracks. 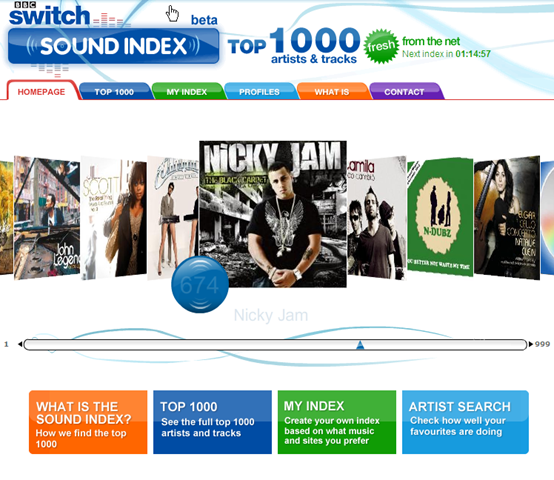 The index is updated every 6 hours, using IBM’s Semantic Super Computing which scans sites such MySpace, Bebo, Last.fm, iTunes, Google, YouTube, monitoring conversations, music listened to, artists watched, and songs downloaded, to establish the most popular 1000 artists and tracks on the web. The more conversations an artist or song receives and the more it is is downloaded or played, the higher up the Sound Index they are listed. 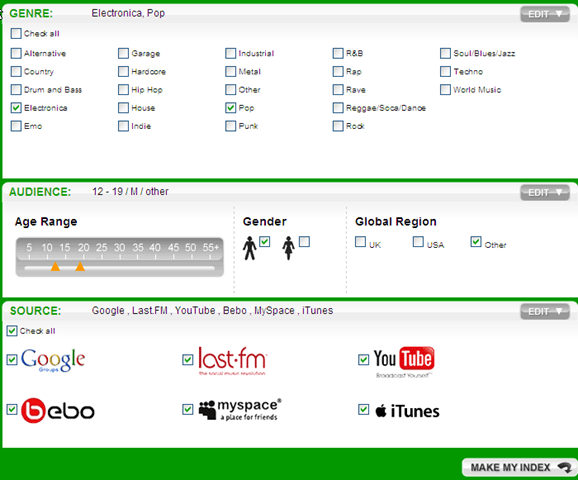 The Sound Index can also be filtered based on genre, location of people and age group. Whilst you are unable to “click through” to the actual conversations for a given artist, this index represents a good indicator of their marketing performance. I can see these type of measures being applied to almost any industry or category. The Food Index, The Restaurant Index, even the Agency Index. Are you monitoring what is being said about your brand or service?